Well, how else would you get dollhouses except from a Dollhouse factory? The interior is composed of a large work room , an office, a packing room, a display room and a small storage area. 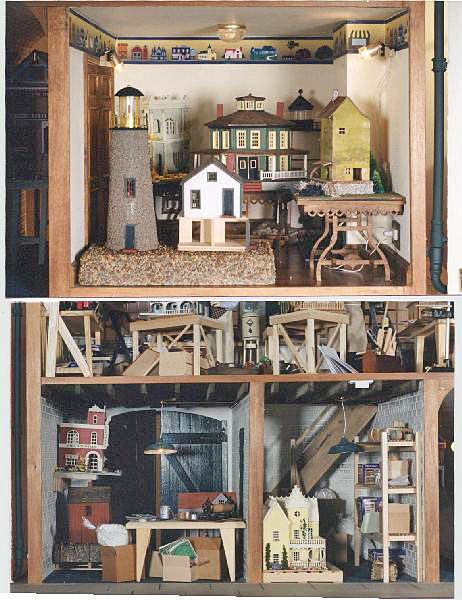 To create the 1/144 doll houses I purchased several kits and started building. Some of the houses are finished, some are partially complete and a few are just still pieces. 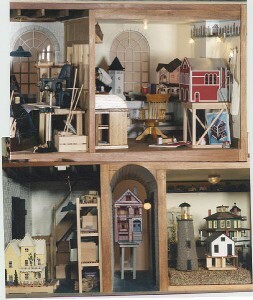 All the pieces that “extras” in the factory, actually go to a dollhouse. There are no miscellaneous pieces of wood. 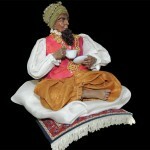 Everything fits with something else.Many of the finished houses were provided by fine artisans. Tom Gudgel, Pat Russo and others made their “mark” in this factory. 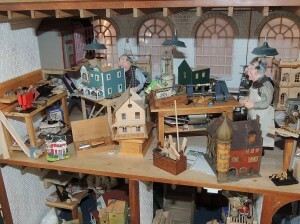 Every house on display in the factory is one inch scale and all the pieces, finish woods, tools, paints and supplies (including the nails) are to scale. (I have found when building houses, keeping all items to scale creates the illusion. Scattered pieces in varying sizes creates a three dimensional optical illusion and is uncomfortable for me to “live in”. 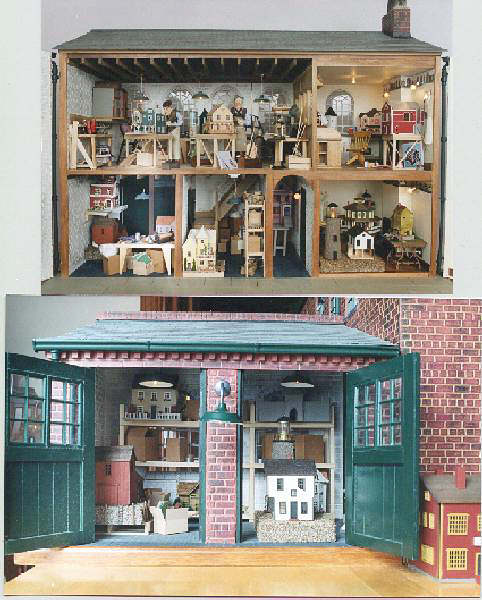 The factory has been updated over the years to include a small working drill, a small working sander, dolls (now from Carol Bull, Bags of Character) and many many complete 1/144 inch scale dollhouses from around the world. There are so many extra dollhouses that I was required to create an extension to the factory to hold them! 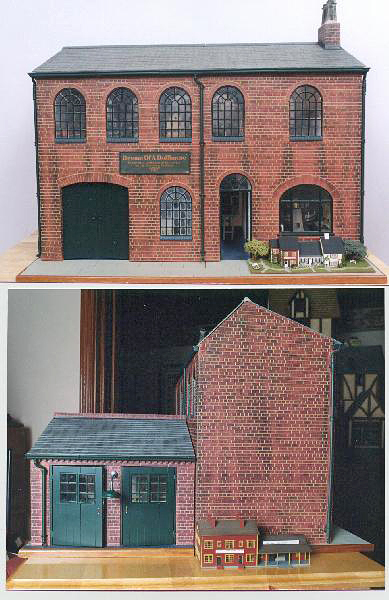 The factory office and show rooms are also complete. 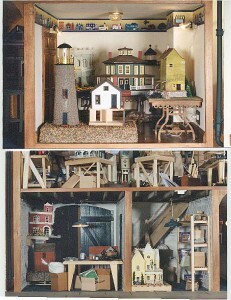 In the top picture, please note the fire station (almost complete), the church (under construction) and the completed house in the background. The fire station has the small but clear photo and finish plans below it. The matching paint and brushes are on the floor for the shop supervisor. The photos above illustrate more finished houses. The upper room with the clearly visible wallpaper border, the spotlights and the finished houses is the Showroom. 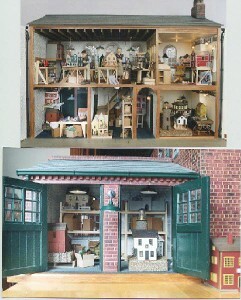 The two rooms in the lower picture are small storage room and the shipping and freight room. The small storage room not only houses a building or two for shipping, it also holds extra shipping supplies, paints, tools, crates, boxes, packing material and a myriad of other very necessary supplies.